When you open a Bible, you see at once that it is made up of many shorter books. Do you ever wonder how people decided which books should be included in the Bible? It was important for Christians to know what was true scripture. For one thing, they needed to know what teachings they should follow. For another, they needed to know what writings they should protect if they had to, because they didn’t want to be tortured or killed trying to save a book that wasn’t God’s word. About a hundred and thirty years after Christ’s resurrection, bishops began making lists of the writings that they regarded as scripture. Their lists were usually close to each other but did not always agree exactly. At the beginning of the year 367, Athanasius, bishop of Alexandria sat down to write an Easter letter to his church. He wrote these “festal” letters every year to put his people into the right frame of mind for celebrating Easter. The church already accepted the books of the Jewish scripture as inspired by the Holy Spirit. These became our Old Testament. The church also agreed that books and letters written by the apostles or by writers under their direct influence were probably scripture if the books had been used for a long time by the church. These became our New Testament. Athanasius thought it best to list the trustworthy books. He was the first man to compile a list of New Testament books as we know them. His list for the Old Testament did not include the apocryphal books or Esther. 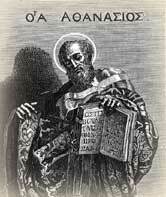 Because of the importance of the city of Alexandria, Athanasius was a well-known bishop. Much of his life was spent battling heresy, especially Arianism, which denied the divinity of Christ. His strong views got him into trouble with the emperor and he was forced into exile five times. Each time, the Egyptians welcomed him back. Because of his influence, his list of books helped settle the question of which books do and don’t belong in the Bible. People recognized the truth of what the great bishop wrote. The books of the Bible are not God’s word because Athanasius said so; they are in the Bible because almost everyone in the church recognized them as coming from God. Athanasius was only expressing the conviction and practice of most Christians across the Roman Empire. Aland, Kurt. Saints and Sinners; men and ideas in the early church. Philadelphia: Fortress Press, 1970. Bruce, F. F. The New Testamant Documents; Are they Reliable? Grand Rapids, Michigan: Erdmans, 1971. Hough, Lynn Harold. Athanasius: the hero. Cincinnati: Jennings & Graham, 1906. 4. “Athanasius” and “Canon of Scripture.” The Oxford Dictionary of the Christian Church. Edited by F. L. Cross and E. A. Livingstone. Oxford, 1997. THE RESURRECTION: The Greatest Miracle? or the Greatest Lie?